"This is the essence of discrimination: formulating opinions about others not based on their individual merits, but rather on their membership in a group with assumed characteristics." Philadelphia is one of those recent classics that, while aware of it since its release, we never managed to see from start to finish. So now, fifteen years later, we catch up with it! And what a nice film it is. We use the word "nice" thoughtfully, because it tackles what was, at the time, a very controversial and emotional topic - HIV/AIDS - in a dignified and relatively tame way. The original New York Times review notes, with some disappointment, just how unprovocative this film is, but we - ever the pragmatists - are content to see Philadelphia as an important stepping stone in the mainstreaming of certain issues into American cultural life: that is, homosexuality, homophobia and HIV/AIDS. A brief, personal aside: in our travels around the world, the one thing we have grown to deeply appreciate about American culture is its "diversity education". There was a great article (maybe in Tehelka?) about this, but we can't find it anymore. Anyway, diversity education is a relatively recent thing, with mostly the X and Y generations inaugurating it in a post-Civil Rights Movement, post-Flower Power USA. We at the PPCC still have fond memories of our elementary and high school indoctrinations about how racism, classism and homophobia are WRONG (IN CAPITAL LETTERS!!!) and never to be tolerated. Ahh, Sesame Street. Ahh, Mister Rogers. You taught us so well. Ahh, after school specials about Martin Luther King Jr. and Very Special Episodes about how, yes, you can make out with someone who has AIDS, but always use sterilized needles and never mix blood with your friend in order to become "blood brothers/sisters". (Did anyone ever actually do this, by the way? Even the ten-year-old PPCC was like, "Mixing blood...Whut?") Philadelphia, we think, is a great example of this diversity-minded culture at its best. Yeah, 1990s! Another brief aside, on the 1990s in general: what memories Philadelphia brought back! 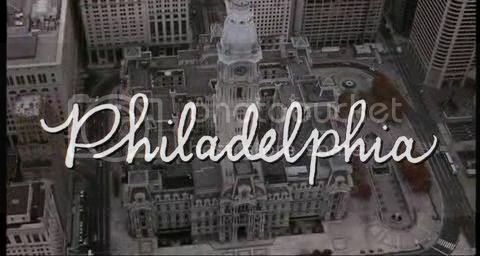 Immediately, with the first tracking shots of Philadelphia's neighborhoods - with those funny haircuts and bleached jeans and puffy jackets - with Bruce Springsteen's gorgeous track in the background, we were transported back to the days of watching those same scenes and that same song on MTV and crying generously into our New Kids on the Block sweater. We don't have the sweater anymore (at least, we think we don't), but we cried again today, older and wiser, into our much more hip, 2009 t-shirt. Man, this movie took us back. But let's talk about the movie itself now. Based on the true story of Geoffrey Bowers, Philadelphia centers around the unjust firing of a prominent young lawyer, Andrew Beckett (Tom Hanks), from his prestigious law firm. The film opens efficiently with scenes showing us Beckett the hot shot in the office being offered a promotion, and Beckett in the hospital for his periodic check-up. While it's not voiced until later in the film, it is clear that Beckett has AIDS. On a parallel storyline, we follow Joe Miller (a wonderful Denzel Washington) in his much less prestigious, much more "We make money for you!" office. With excellent narrative efficiency, we skip over several months of time and the actual firing, and we end up on the day when Beckett, now looking emaciated and quite ill, comes into Miller's office looking for legal representation. As he explains, he believes he was framed to look incompetent and fired based on his homosexuality and AIDS. 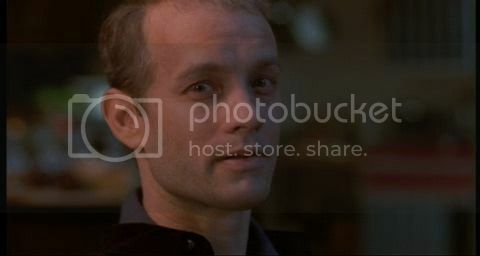 Miller, which the film slowly reveals to be strongly homophobic, quickly pulls his hand away when he hears that Beckett has AIDS. Eyeing him, he asks, "How many lawyers did you go to before me?" It's not a great start to a beautiful friendship, but beautiful and poignant it does become. After lengthy hesitations over several weeks, Miller eventually gives in and agrees to take the case. The rest of the film follows the relatively straightforward trial scenes, with occasional - often very touching or disturbing - moments exploring the attitudes towards these issues during that period. This film is basically a morality play, and so the characters are fairly bluntly sketched: the evil, bigoted law firm partners, Millers' good ol' boy homophobic barfly buddies, Beckett's nearly angelic family. Nonetheless, there are some great moments, such as when a young man gently flirts with Miller in a Rite-Aid, causing the latter to flip out. Indeed, we agree with the New York Times reviewer that the character of Miller is the most compelling: he's the only one that really captures the duality and complexity of prejudice. Watching his beliefs change, and how he chooses decency and helps despite his prejudices, is touching. 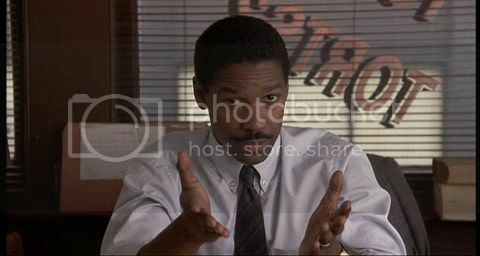 Denzel Washington, who is always great at playing characters with great humanism, is just fabulous. Indeed, the sense that Beckett is a martyr whose death becomes a symbolic sacrifice for a better, post-homophobic, more tolerant world is a fascinating, almost eerie, concept. The movie doesn't go too much into this though, and indeed, the opera/Jesus scene feels too over-the-top and stylized compared to the rest of the film's more low-key earnestness. Overall, though, it's a great, uncomplicated tale with an important, positive message. Definitely recommended. I've often read about children doing this blood mixing this, usually in cutesy books where they use it as a rite of togetherness. Personally, when I was a child, the goal was NOT to make myself bleed. Bleeding hurt. Ergo, bleeding Not Good. Philadelphia is one of those movies that I'd never rewatch. I cried all the way through it and that was enough for me, thanks. But yes, very powerful and yes, Denzel is wowsies.